A trust allows a trustee to "hold" assets for a beneficiary and often dictates how assets are passed on to beneficiaries in the future. Typically, beneficiaries can access these assets more quickly than they can with a will since trusts generally avoid probate. Also, irrevocable trusts aren’t usually considered as an aspect of a taxable estate, which is definitely a benefit for your beneficiaries. Trusts can be a fairly valuable asset when you’re doing estate planning; they can help safeguard your assets from long-term care costs and preserve and protect your estate from unforeseen loss. 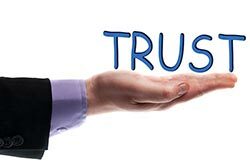 Unfortunately, without professional guidance, many trusts still don’t work as they should. Trusts often don’t work because people don’t properly fund the trust. Funding a trust properly can help ensure that your assets are managed and administered properly among your family members and loved ones. While a will can certainly provide the same benefits, there are some differences. The best thing you should do if you’re considering a trust is to discuss your situation and needs with a professional estate planning attorney. An attorney can help you find ways of funding your trust properly, managing the "whens" and "hows" of your asset management. When you’re discussing long-term care with your loved ones, it may be best to have a professional attorney experienced with elder care to act as a “mediator.” The Elder Law Firm PC has many years of experience providing Medicaid planning for Michigan residents. If you wish to talk with us about Medicare, Medicaid, or other long-term care options, feel free to call us at (877) 933-7252 to learn more. Residents in the Grand Rapids area can also attend a free seminar led by attorney The Elder Law Firm PC several times a month about Medicaid planning. Call to reserve your spot at this exciting and informative event.